"I have to say, I am skeptical when it comes to new fitness and training equipment, but I was surprised when I started using GripSling and realized that it actually aligns with my training philosophy; learn to move your body, keep things simple, and make it fun. GripSling hits all 3 of those for me and continues to be a great additional supplement to what I do in my strong man training as well as with my clients. This is one of those tools that is only limited by your creativity. Great buy for anyone into exercise, fitness, or training outdoors." "The GripSling straps have added a whole new element to my workouts. They allow for new dynamic exercises, as well as adding a challenge to more basic movements by increasing the grip intensity as well as stabilization. They're also a great tool to have in the gym bag to help reduce stress on the wrist with movements like front squats. My favorite thing so far with them has been the partner training: I've never seen another training tool that allows two-person exercises like the GripSling." "For Powerlifting and especially Strongman, grip and back strength are vital to success on competition day. GripSling has helped out tremendously with my upper back and handgrip strength. The straps allowed my lifting buddies and I to combine many exercises, including Rows, Pullups, Facepulls and Bicep curls, with the grip training needed to hang on to barbells, stones or other odd objects that are found in Strongman competitions. For anyone who wants to get away from the "easy" training of machines and cables, this piece of equipment is for you." 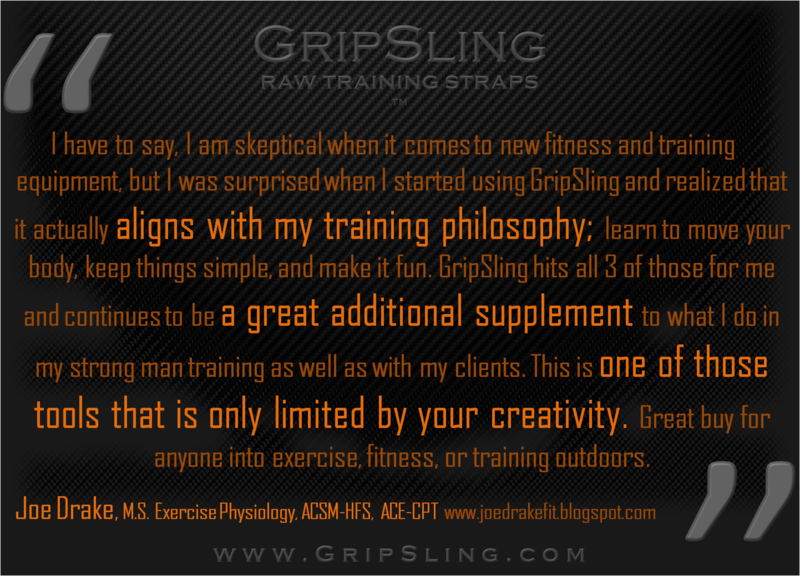 "GripSling is an awesome product and I highly recommend everyone to implement it into their workout routines. Since using this product, I have developed incredible grip strength and have broken various PR's in my lifts. I take GripSling where ever I travel because it allows you to train about anything you want, it’s simple, and it makes exercising more fun. GripSling is limitless and I am one satisfied customer… Do yourself a favor and get GripSling!" "Gripsling has added an entire new dynamic to workout! In this day in age when working out is equated to exercising in a gym, Gripsling has been able to fully restore my outdoor workouts without the need for already built in infrastructure (monkey bars or a pull up bar). Its light, easy, and just looks awesome when you hook it up to a tree branch and start knocking out some pull ups in the middle of your daily 3 mile run!" "Through a lot of trial and error (and a lot of money poorly spent) I've quit other workout programs due to a loss of interest. However, GripSling's endless possibilities for workouts and its fun styles of training has renewed my motivation to exercise! Since I've purchased GripSling, I FINALLY love working out." "I have been using my Gripsling non stop recently and I love it! Since it's lightweight, I can bring it with me for staggered cardio/interval training. It's very strong and I wouldn't hesitate to wrap it around the heaviest object available to get some strength training in. Thanks again for such a great piece of equipment!" "The grip-sling is amazing for crossfit training and as a yoga strap... The best part is its light and versatile enough I can bring it on base changes and still find ways to train!" 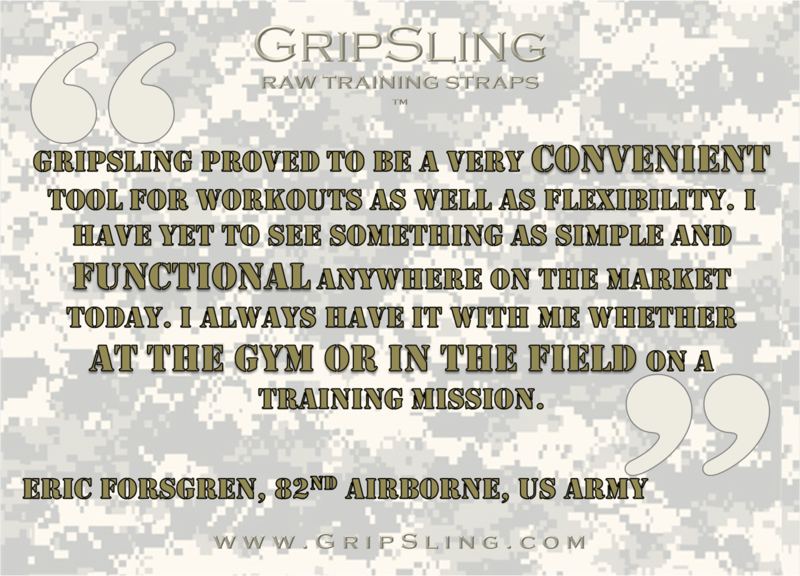 "The first time I ever used Grip sling, was at my gym. It's an amazing tool. We've used them in stretches and exercises. Very versatile and durable. 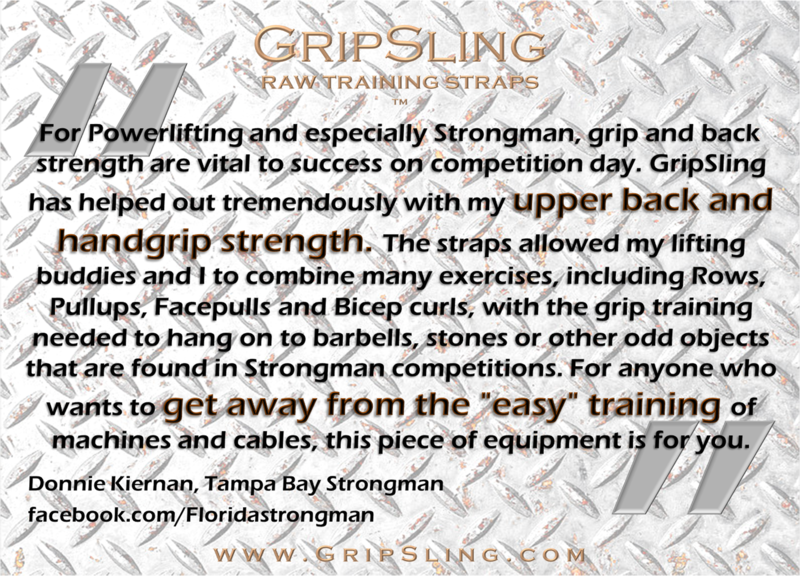 I'm extremely impressed with Grip sling, and look forward to many uses with it!!" 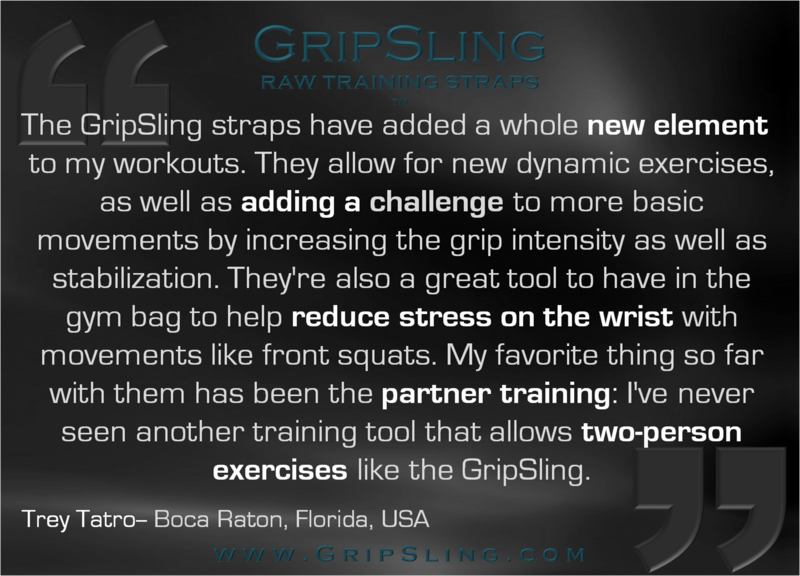 "GripSling proved to be a very convenient tool for workouts as well as flexibility. I have yet to see something as simple and functional anywhere on the market today. I always have it with me whether at the gym or in the field on a training mission." "After years of trying, the GripSling helped me get my first ever pull up this past summer... after only 3 days of trying! the movement was slightly altered using the GripSling, allowing me to really focus and feel the muscles I was supposed to be using. I also find that as a Stay At Home Mom, the GripSling is a great tool to have on hand to get some quick reps in through the day!" 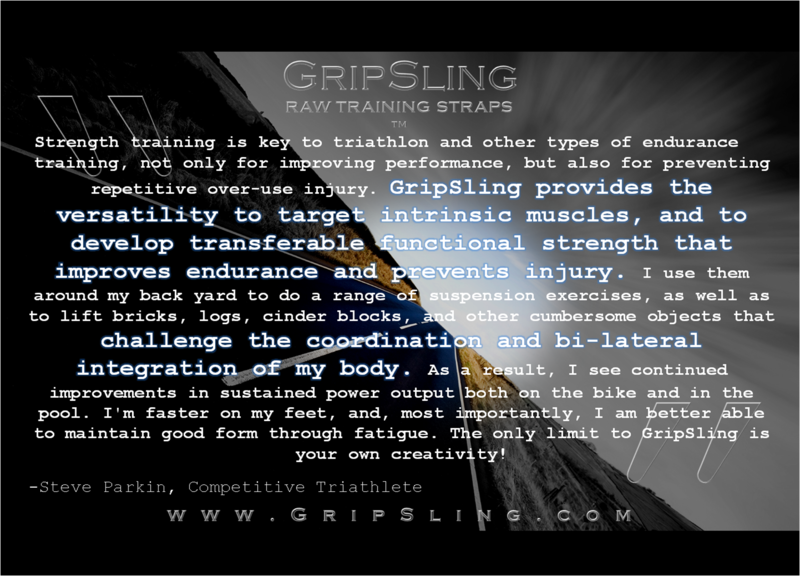 "GripSling provides a dual purpose for me. I use it for weight training because it's very effective for hitting lots of different muscle groups. Also, I use GS for stretching and flexibility while performing yoga. It allows me to further stretch those pesky muscles that sometimes don't want to cooperate. I recommend the straps for both resistance and flexibility training." "Strength training is key to triathlon and other types of endurance training, not only for improving performance, but also for preventing repetitive over-use injury. GripSling provides the versatility to target intrinsic muscles, and to develop transferable functional strength that improves endurance and prevents injury. I use them around my back yard to do a range of suspension exercises, as well as to lift bricks, logs, cinder blocks, and other cumbersome objects that challenge the coordination and bi-lateral integration of my body. As a result, I see continued improvements in sustained power output both on the bike and in the pool. I'm faster on my feet, and, most importantly, I am better able to maintain good form through fatigue. The only limit to GripSling is your own creativity!"